Family Owned, Highly Experienced and Focused on You! Home inspections in: Albany, Saratoga, Schenectady, Troy, Clifton Park, Rensselaer, Cohoes, Guilderland, Niskayuna, Ballston Lake, Malta, and surrounding areas of NY! Watch Our Short Home Inspection Video! Buying a new home is one of the biggest investments most of us ever make in life. And its a decision that will affect you for years to come. The process can be extremely stressful and sometimes even confusing, But here at Spec-Pro Home Inspections we will put you're mind at ease. A professional home inspection from Spec-Pro Home inspections will significantly reduce your risk and will help make the entire home buying process easier and less stressful. We really enjoy helping our clients in this process. Customer service and a quality home inspection are our highest priorities. We have performed thousands of home inspections throughout the Capital Region. So see why so many continue to choose us as their home inspector! Like selecting a new home, selecting the right home inspector can be challenging. Most likely, you will not have a chance to meet us until you hire us to perform your actual home inspection. This makes home inspectors a very unique trade. Furthermore, different home inspectors have varying inspection qualifications, inspection equipment, experience, home inspection reporting methods, and even different pricing for their inspection services. That is why we want to assure you that we promise to work our hardest provide you with the best and most comprehensive home inspection and report possible to ensure that you can make a confident decision about buying a home. It is one of the most important and expensive financial decisions most people make during their lifetime. I am a dedicated and qualified home inspector who takes pride in providing my clients with a high quality, impartial home inspection. Everything identified during the inspection is well documented in an easy to understand electronic report including pictures. The report is e-mailed to you the same day as your home inspection. If you honor me by permitting me to inspect your new home, I guarantee that I will give you my very best effort. This I promise you. Download our new free home inspection book. Just click on this link and enjoy! 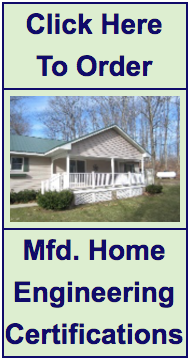 We now offer manufactured home foundation certifications. We do not perform engineering services, but we gather the information required and the engineer produces the report. This is a federal requirement when purchasing a manufactured home. We are a one-stop inspection company for manufactured homes in this regard. ​Simply click on the button to the left, fill out the order form, and then we will gather the info, send it to a licensed engineer, and you will have your report in a few days. "Ian was extremely professional and thorough. He explained the purpose of the home inspection as well as the procedure he would be using. He was equipped with a variety of different tools to measure moisture in the attic and in the basement, he tested all the outlets for appropriate electrical compliance. During the home inspection, he talked about certain maintenance that should be done and why it was important. He was respectful of the home owner and was careful to wear clean shoes (changed from his boots) when inspecting the interior of the house. The home inspection report was generated within hours of the inspection and emailed to me in a pdf. It was detailed and clear with multiple pictures demonstrating the areas of concern. He was a pleasure to work with and would use him again if needed. My real estate broker and the sellers broker were equally as impressed and wanted his business card." "Ian is a true professional. He arrived early to inspect the roof, and walked through the rest of the house with us. He gave us a lot of great suggestions on how to reduce energy costs and mitigate other issues that became apparent during the inspection. As first time home buyers, we had a lot of questions. He welcomed all of them, and answered clearly in non-contractor lingo. He's very personable and it's obvious that he takes great pride in his work. I absolutely recommend him for your home inspection needs." "Ian did a great job explaining everything as he went through his home inspection. The ultimate pro at what he does! Even after we had problems with the underwriter Ian went out of his way to help us solve the problem." "The home inspector did an awesome job. They are really good. I would highly recommend them, they were very thorough. He squeezed me in a little earlier with the schedule, which was great. He was very professional to work with." "We have been very pleased with Ian's service from Spec-Pro Home Inspections. We were so pleased with his inspection for one our homes that we used him again just recently. His assessment is very thorough and found him very personable and professional. After the inspection, Ian prepares a detailed report with pictures identifying issues that were identified that may need addressing. You will not be disappointed with his quality." "Thank you again for a very thorough and extremely competent job. I think you may have saved me from a potential situation that I would have regretted putting myself into. I will gladly call on you again when I find the right home for me, and I will happily refer to to anyone I know who needs a home inspection. " Are you looking for home inspectors in Albany NY? We provide home inspections in These areas of Albany and More: Guilderland, Voorheesville, Feura Bush, Bethlehem, New Scotland, Colonie, Altamont, Delmar, Slingerlands and all surrounding areas! Are you looking for home inspectors in Saratoga NY? We provide home inspections in: Saratoga Springs, Saratoga Lake, Round Lake, Greenfield Center, Clifton Park, Vischer Ferry, Malta, Ballston Lake, Stillwater, Waterford, and all surrounding areas! Are you looking for home inspectors in Schenectady NY? We provide home inspections in: Delanson, Duanesburg, Scotia, Niskayuna, The ity Of Schenectady, and all surrounding areas! Are you looking for home inspectors in Troy? We provide home inspections in many areas of Rensselaer County: Troy, Brunswick, Poestenkill, North Greenbush, East Greenbush, Schodack, and all surrounding areas! We use the information that you put into this form to be able to contact you, discuss your home inspection, and to eventually deliver your report and answer any questions that you may have. We DO NOT distribute, sell, or otherwise abuse your personal information. Your privacy is important, and it is important to us as well.